drinkdrank: Did I Just Hear a Collective Sigh of Relief? I'm never amazed at the depths to which big beer makers will go to add a gimmick to their beer. However, Miller's newest invention—The Miller Lite punch top can—takes the cake. Usually, I give no mind to whatever dumb thing the big boys use to sell their beer. If you want to only drink beer that comes from a can that changes color, by all means knock yourself out. That being said, the punch top can is just stupid. Thanks to MillerCoors for all their good work. 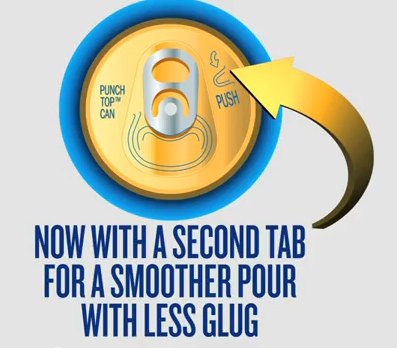 Miller is advertising its new can as having a second tab "... for a smoother pour with less glug." Here's the concept: you open the can via the pop top; then use a key, a pen, or the ice pick you just stabbed into your brain, to "punch" the top of the can at a different, pre-designated "punch" site. The second "punch" evacuates the vacuum formed inside the can, meaning the beer will flow totally free and arc magnificently into your glass—unlike those other so-called "canned" beers—from which their contents pour like cold gravy. The newly "punched" top also allows you to control the rate of the pour. Just in case things get crazy, simply place your thumb over the can's freshly minted orifice, and the stream of poring beer slows down. You'll actually never be able to notice that it slows down with the naked eye, but on the television commercial, when filmed in slow-motion, it's totally obvious. Is this a problem that Miller needed to address—Is there an issue with the viscosity of Miller Lite? Did market research determine that MillerCoors drinkers are demanding hydrodynamic analysis be implemented on their aluminum cans? Even more amazing is that this is Miller's second attempt at perfecting the pour. They revolutionized beer pouring with their Vortex bottle, introduced in 2010, which forces the beer to twist in a counter-clockwise (or perhaps clockwise—I really haven't looked into it) fashion—like a slug from a rifled barrel. Smooth and twisty every time. I think MillerCoors collaborated with white coated, NASA engineers to develop that one. It's amazing stuff their doing in the R&D department over there at MillerCoors. What kind of idiot can't figure out how to pour beer from a can into a glass? Besides that, who is even drinking canned Miller Lite from a glass? Isn't that the genius of American canned beer—it's meant to be drank ice cold and from the can? Let's be honest, with innovation like the punch top can, it's only a matter of time before we see other amazing breakthroughs—like "see-thru" pint glasses, so we'll know when to get more Miller Lite. hurrah for Miller, geniuses indeed. Don't worry arn, Miller's "Pre-Opened Beer Bottle Technology" is on it's way to South Wales as we speak. I'm afraid they'll have to wait as the Welsh Government made it law that we have to be ten years behind the rest of the modern world. 2022 – Just in time for the Miller Lite "cube"
. . . Fort George [Astoria, Ore.]-Vortex IPA [97 IBUs9/7.7% ABV] is a very godd PNW IPA; Citrus, pine, fruit, and flora hops, sweet caramel malt aromas/tastes; medium body; balanced and sweet. Cascade, Simcoe, and Palisade hops / Organic Gambrinus Pale, Victory, Crystal malts.
. . . Pity the Miller drinkers. Are you implying, Jack, that Miller is in a swirling mess? But, I, a signer of the craftbeer.com 'Declaration of Beer Independence', choose to drink flavorful, authentic, American craft beers from small, independent [and predominately local] brewers.